Marton Cricket Club was founded circa 1853, with the first newspaper report in 1864 of a match against North Ormesby. For the first hundred and twenty years or so, games were played on land adjacent to and just to the south of the Rudds Arms Public House on Stokesley Road. They were a true village side, with John Handisides, the local blacksmith, their best player. In 1885, Marton were founder members of what became known eventually as the Cleveland and Teesside League, they enjoyed much success. 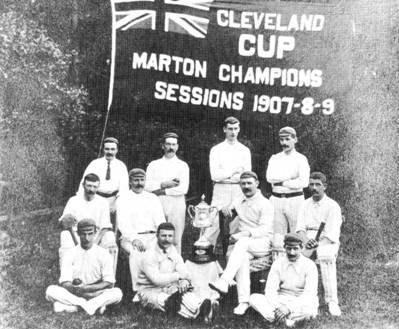 The Cleveland Cup in the trophy cabinet six times in twelve years around the turn of the century, with Jack Newstead, a Yorkshire County player in the side. The Brunton & Appleton families have been synonymous with Marton cricket throughout most of the 20th century. William Brunton was the Club President, 1st XI Captain, Groundsman and also Landlord of The Rudds Arms (Bill Brunton seemed to have his work / life balance about right?) George Appleton was Chairman and later Secretary of the Cleveland Cricket Association in the 20’s and 30’s. His son Harold, a player and later Club Chairman & President, was responsible for the tree planting we see surrounding the present ground today. In 1925, Marton joined the North Yorkshire & South Durham League ‘B’ Division and have continued their association with the NYSD since. Elevated to the ‘A’ Division for one season in 1940, the Club failed to complete its fixtures finishing bottom of the table with a meagre 4 points. The reason was quite simple, 10 of the 11 senior players were all called up for war service during the season! 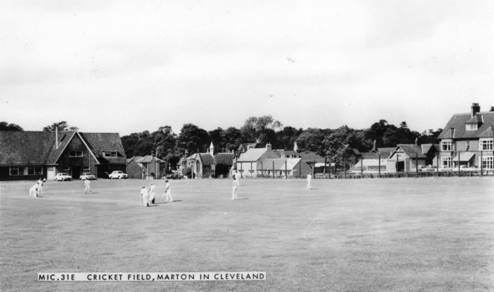 In 1951, the cricket field was gifted by William Brunton to the then recently founded 'Marton-in-Cleveland War Memorial Playing Fields Trust'. This is recorded on the plaque on the pillar at the entrance to Memorial Drive, off Stokesley Road. This trust land was designated for sporting use by the people of Marton. Nowadays the playing and social areas are managed under the joint stewardship of Marton CC and Marton War Memorial Trust. The Sparks family (local bakers) used to live on the site of the Marton Hotel & Country Club (now closed for business). Mr Sparks offered 10 shillings to any Marton batsman who could break a window in his house with a six hit! Rumour has it that the 10 bob note never left his wallet! The north facing photograph below, shows the Marton cricket field in the 1950's. In the background is The Rudds Arms (left), Marton Post Office (centre) and the Sparks house (extreme right). The tall tree in the far background (centre) is in Stewart Park and very close to the birthplace cottage of Captain James Cook (RN). The Marton Cricket Club badge depicts Captain Cook's ship, the HM Bark Endeavour. Major changes came about in the 1970's, when the council decided part of the cricket field was to be the slip-road for the new A174 Marton interchange. A quid pro quo was agreed with the council, whereby the original field was exchanged for the present 'Parkway' ground, which opened in 1973. 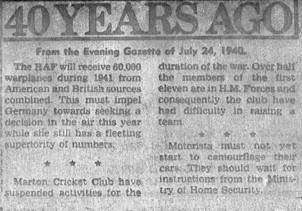 This enforced move proved to be the catalyst the Club needed to develop into the community club it is today. This change, coupled with the foresight of several club members who saw the potential for the club in the growing community of Marton. These members were most notably Fred Brunton, Harold Appleton, Trevor Gaynon & Dave Foster, who worked voluntarily in a variety of areas to enhance the Marton Cricket Club cause. Marton Furness Hockey Club joined in 1976 and played on the cricket outfield. The club is particularly proud of the numerous achievements of their thriving Junior Section, which was founded in the late 1970's, under the initial guidance of coach Keith Brett. In the 1980's Marton juniors (U17's, U15's & U13's) were prolific winners of the various area age group league and cup competitions, with the Under 13's All England Finalists in 1981. This early success has been continued year on year to the present day. Marton have been Champions of the old 'B' Division on 4 occasions & a record breaking 10 time winners of the Haith Cup. The Club gained promotion from Division 1 to the Premier Division in 2005 and enjoyed league and cup success relatively quickly. In 2007, the overseas professional was a young South African, Imran Tahir, who helped secure the MacMillan Cup that year. Imran has since gone on to be a world class bowler with the Springboks, representing them 140 times (and counting) in all formats of the game. The most successful year in the long history of Marton was arguably 2009, when led by Graham Shaw, they became Premier Division Champions, Kerridge Cup & MacMillan Cup winners and runners-up in the Premier 15/15 final. Success continued in 2011, when Marton were crowned Premier Division Champions again and in 2013 they lifted the Kerridge Cup for the fourth year out of five! In 1975, Marton's first Clubhouse was affectionately known by it's members as 'The Wooden Hut', it was replaced in 1981 by the brick built building used today. 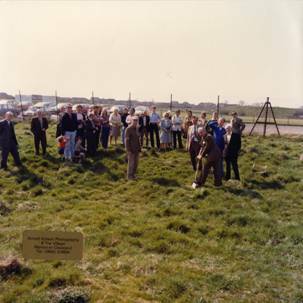 The photograph shows the first sod being dug for the new Clubhouse by Club President Fred Brunton in 1980. The new Clubhouse proved to be very popular with both sporting members and an ever increasing social membership. So much so that it was extended in 1993 and again in 2005 to provide improved member facilities and also a spectator balcony overlooking the ground. Several local community groups regularly use the facilities, either in the Harold Appleton Lounge or the Fred Brunton Bar. The Presidents Lounge is a members (and their guests) only room. A separate pavilion block & outdoor artificial nets were constructed in 1995, with a new tea room and balcony added to the pavilion in 2012. Three new 'state of the art' outdoor nets were opened in 2016. Quite a journey from being a village side in the late 1800's, to running two sides in the 1950's, and three sides plus an under 17 XI in the 1970's. The ground change in 1973 and the explosion of junior cricket soon afterwards, lead us to the present day set up. Marton CC now field three weekend teams in the NYSD Leagues and a further eight junior age-group teams (including girls) in various area leagues.